North Braddock, overlooking the steelworks. Recently a French film crew came to Braddock, PA sensing that the fate of Braddock might well be the same for Western Europe. 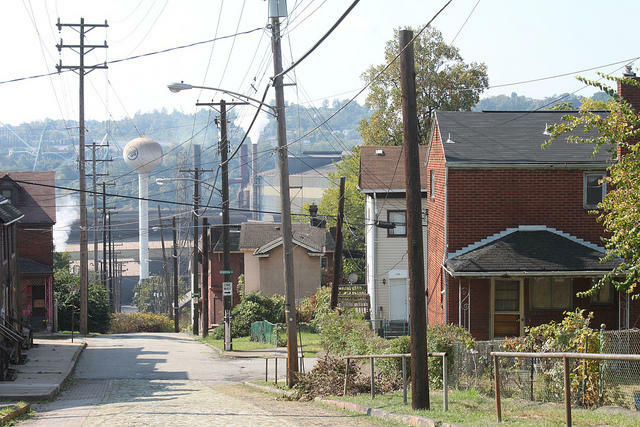 What they discovered is: From George Washington to Andrew Carnegie, through the French and Indian War, to the collapse of the steel industry, these few acres along the Monongahela River have always been a battleground. The film Braddock America – which played at the Cannes Film Festival and the Three Rivers Film Festival– lets the people of Braddock tell their stories, as they weave together the past, the present, and the future. Co-directors Gabriella Kessler and Jean-Loïc Portron have different backgrounds and experiences but they found common ground in Braddock. Gabriella Kessler is a French-American documetary filmmaker, from New York City. She says Braddock America is a story of memory and commitment. And Braddock acts as a sort of case study for post-industrial cities all over the world. "We never use the term 'interviews,' because we always wanted it to be a dialogue. And in the film we don't identify people we don't put what their names are, their roles. Because we wanted it to be a chorus, we wanted it to be one voice. Jean-Loïc Portron is a Frenchman who has worked on a variety of projects in France and abroad, in places like post-apartheid South Africa. He recognized the story of Braddock as a story that Western Europe could relate to. "The French audience realized immediately, at the first screening, 'it's our own story. It's happening there in Pennsylvania, but it's our own story too.' And it could be farmers, it could be workers. We live that same story, and they're our brothers, they're our sisters." More than 40 business, university and economic development leaders from France are in Pittsburgh this week to rendezvous with their Pennsylvania counterparts. The high-level delegation is led by Jean-Jack Queyranne, the president of the Rhone-Alpes region in France. That’s equivalent to an American governor. The trip is a follow up to Gov. Tom Corbett’s business development mission to France in March 2012. Queyranne said his region and Pennsylvania have a special relationship. “The keys of success are innovation and entrepreneurship.” François Delattre, French ambassador to the United States, discusses what he’s learned from Pittsburgh when it comes to reinvention after industrial decline and new opportunities for a Franco-American partnership.